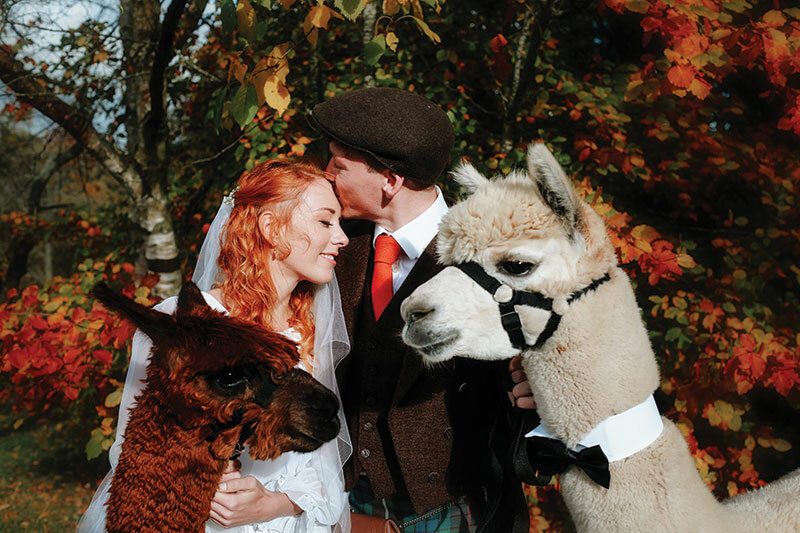 Velvet Hall Alpacas has your alpaca-tastic wedding all mapped out. 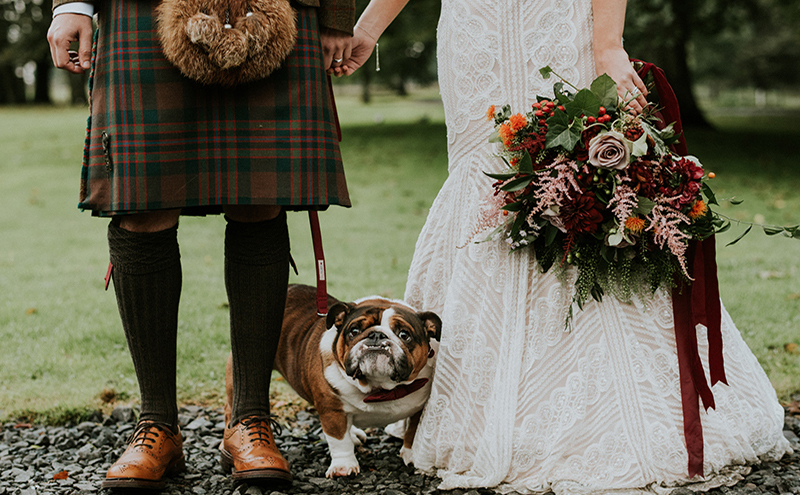 “They’re used primarily as ring bearers, where they have a collar, bow tie and velvet pouch around their necks,” explains Stuart Ramsay of the Borders company. 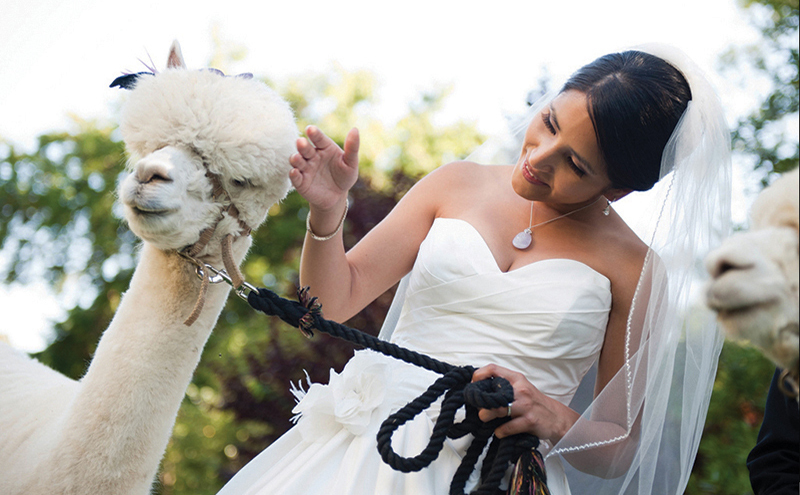 “The rings are delivered by male alpacas as they are walked down the aisle. 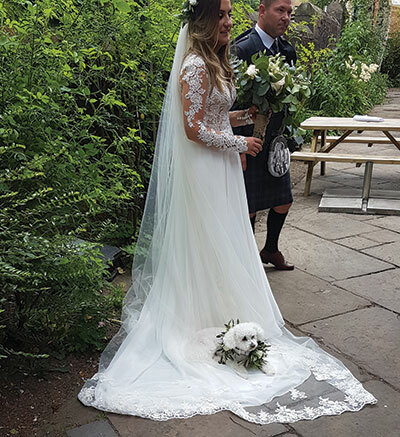 After the ceremony, they are happy to be part of the official photography, whether indoors or outside in the gardens. Couples can then lead them around, where they can mingle and be introduced to other guests.” On average, Velvet Hall’s herd will stick around for four hours, which is plenty of time to get unbelievable, squeal-worthy portraits like the above. Canines are Kellyann Daly’s life. 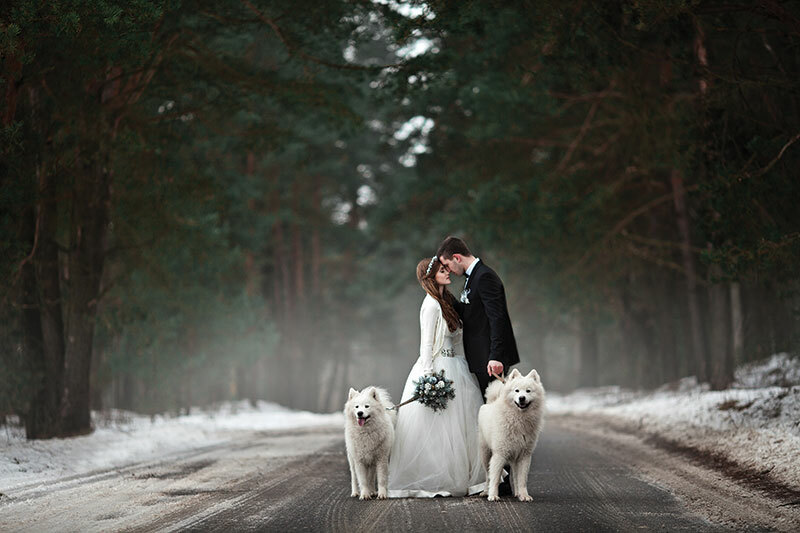 Who better to understand the need to have the pitter-patter of tiny paws down the aisle? “It’ll be three years in April since I started my dog-walking business,” Kellyann reflects. 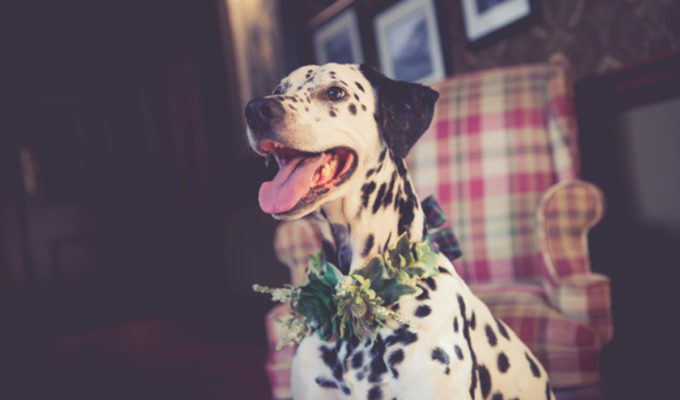 “I was trying to think of a way of expanding my company and came up with Daly’s Walks, a wedding chaperone for pets. I work with groomer Arlene Thompson of Spruced Up and boarder Angela McNally at Just Fur Fun, and collectively we provide bespoke packages.” Currently working with 53 dogs per week, Kellyann can handle anything your fluff-ball can throw at her. 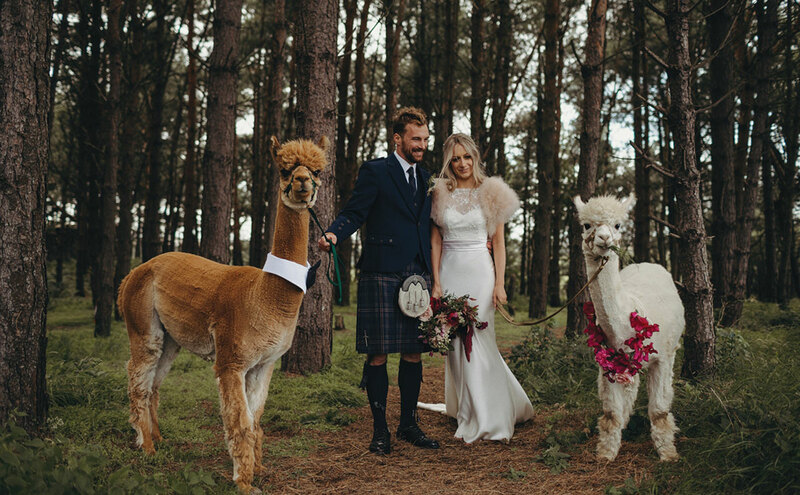 Based at the foot of the Pentland Hills within 12 acres of farmland, BobCat Alpacas is a fresh name on the scene. “We are fairly new to this work,” says Cath Crosbie, one half of the BobCat team along with partner Bob. “When Bob retired from the civil service, we decided a change of career was called for. Prior to this, our animal family was restricted to rabbits! 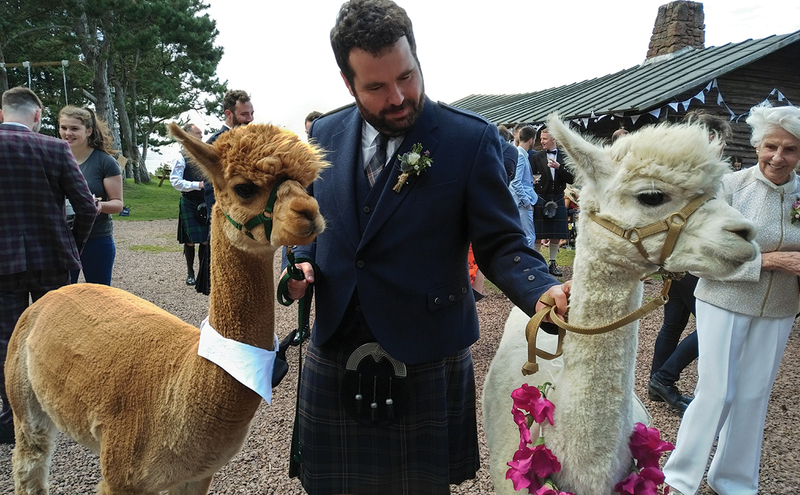 Now our core business is caring for and breeding alpacas and the annual harvest and processing of their fleece.” When the alpacas aren’t chilling out on the farm, they’re acting as therapy animals (we know – aw!) or as special wedding guests, kitted out in bow ties and veils. Thanks to a certain film franchise (hello Harry Potter), we’re obsessed with the idea of getting hitched with the help of our very own Hedwig. 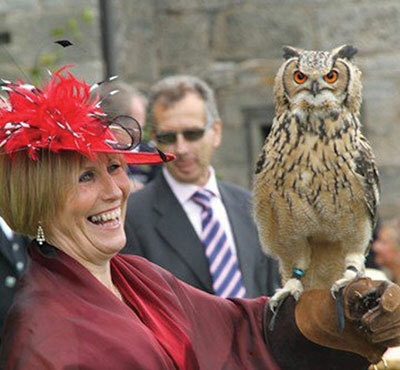 Consider it done with Elite Falconry’s birds of prey wedding service. As anyone who’s ever owned a doggo will tell you, leaving their sad face behind in the morning is torturous. Can you imagine how much worse the FOMO will be if your number one (albeit impractical) pooch isn’t at your nuptials? 20 ways to make your wedding WOW!